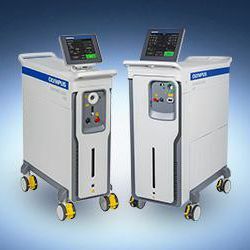 The NEW Olympus EMPOWER Holmium:YAG laser portfolio offers 35W and 65W systems with a full-range line of laser fibers to meet the diverse lithotripsy challenges physicians face each day. The laser fiber portfolio of the EMPOWER system offers a ball-tip fiber, that allows the physician to insert the fiber through a deflected scope, while maintaining visualization of the stone. The efficient system design of the EMPOWER H35 and H65 enables higher frequency settings compared to competitive systems at similar power offerings.